I took you on a stroll down memory lane in my February 2001 Web Master Wanderings article (http://www.scpcug.com/wmwand24.html) describing some of my experiences with the Commodore 64 and 128 computers back in the 1980s. Those Commodore days almost required one to belong to a User Group just for the availability of free software. The same was true for PC users back then. The User Groups of that era, by their exchange of information and knowledge, knew where to go to acquire free software or relatively inexpensive software (shareware). They were the computer user's lifeline. Today, with the Internet, plenty of free software is readily available for download. Just look at the SCPCUG Software Links page (http://www.scpcug.com/softlink.html) on our web site. Rather than listing individual programs, I have listed links to sites that feature many programs and so the links are categorized under Software Collections. Some of this Freeware is very good and rivals the Commercial software available at the retail stores. One of my favorite graphics programs, IrfanView (http://www.irfanview.com), comes to mind but there are many others. If you look at the Web Master Wanderings Index for this column (http://www.scpcug.com/wmwand.html) you will find a number of Freeware programs I have reviewed. Some have fallen by the wayside. Others (like IrfanView) continue to flourish and improve with each new version. Unlike the days of old, much Commercial software is now easily obtainable via direct download from the Internet. It is usually at a slightly reduced price because you do not get the fancy colored box and printed manual. However, depending on the program size, downloading could take quite awhile if you do not have a broadband connection. Commercial software may be marketed in many different ways. Anyone new to computing should be careful when purchasing new software. My first impulse when I got my first PC back in 1995 was to start buying all kinds of software on CD-ROM. If you have a lot of money to waste I suppose you could do that. However, time is on the side of those who wait and do not give in to impulse. Watching the Sunday newspaper ads for Commercial software with rebate sales from stores like Best Buy, CompUSA, Circuit City, OfficeDepot, OfficeMax, Staples, etc. can save you a lot of money in the long run. There are usually several programs they offer that become essentially free (or nearly free) after rebate. The catch is you have to watch each week as the ads and therefore the programs offered keep changing. A link that will help you do this is in the Reference section on the SCPCUG General Information Links page (http://www.scpcug.com/infolink.html). SalesCircular.com (http://www.salescircular.com/) compares retail store sale prices on electronics, computer hardware & software, etc. so you don't have to. This saves you time in having to wade through all the sales flyers each week when trying to make a purchase at the best price. In addition to finding rebates in the Sunday newspaper ads, check three other web sites listed on our SCPCUG General Information Links page under the Investing & Finance section. They are DealNews (http://dealnews.com/), DealUniversity (http://www.dealuniversity.com/index.shtml), and TechBargains (http://Techbargains.com/). In buying any software it also pays to do a bit of research first. For example, over a year ago I decided to buy MGI Software's PhotoSuite 4 which was featured in ads by several stores. CompUSA had offered PhotoSuite 4 Standard Edition with a price of $29.99 minus instant savings of $20 and minus a $10 mail-in rebate so it was essentially free (I pay the tax and the postage to send in the rebate form and documentation). Best Buy offered Photo Suite 4 Platinum Edition for $25 minus a $25 mail-in rebate so again the software was essentially free. OfficeMax was selling the PhotoSuite 4 Platinum Edition for $49.99 or you could buy the PhotoSuite 4 Standard Edition for $29.99 minus a $10 mail-in rebate and they would instantly toss in another program called PhotoVista (supposedly a $29.99 value) free. Meanwhile, Staples was offering PhotoSuite 4 Platinum Edition for $40 with an instant rebate of $20 and a mail-in rebate of $20 so the program was basically free. Which was the best value? What was the real normal selling price of either edition? What was the difference between the Standard and Platinum Editions? The MGI Software web site http://www.mgisoft.com/ did not even list the Standard Edition. (Note that MGI has recently been acquired by Roxio, makers of the popular Easy CD Creator CD burning software.) It all was quite confusing and I wonder sometimes if this so called marketing is not done on purpose just so the consumer cannot make an accurate comparison. My best advice is to do as much research as you can and then get to the store with the best sale as early as possible. Sometimes the item may be limited to just the amount in stock and sometimes you may be able to get a raincheck if they have already sold out. By the way I did go for the Staples deal for the PhotoSuite 4 Platinum Edition as it had more features than the Standard Edition and the Staples deal required me to have the least amount of money outstanding. Some rebate deals, although they sound good on the surface, may require you to have a large amount of money outstanding and waiting to be rebated. I try to keep my exposure to a minimum. Although I have only mentioned software, the same advice applies to purchasing computer hardware. Many of the Sunday newspaper ads feature hardware rebates. I purchase all my blank CD-R media (for burning audio and data CDs) on 50 pack spindles via this rebate route. Rebates are offered on one brand or another every week. From time to time the CD jewel cases can also be found offered in ten packs via rebate for free. Other items I have obtained via the rebate route include my desktop webcam, underdesk keyboard drawer, surge protector, and network interface card. If you do purchase an item with a rebate, be prepared to wait at least three months and possibly longer to get your money back. It has been my experience that although they may say 6-8 weeks for processing of your rebate check, in reality that rarely happens. The longest I have had to wait for a rebate was nine months but in the end the software company honored its promise. The fastest rebate I have received happened just recently. I was in need of another cordless telephone but was looking for one specifically with a headset jack as I already owned two of the around-the-ear hands free phone headsets. In February Best Buy was offering a Northwestern Bell 900 MHz phone (model 39205-1) for $20 with a $10 rebate. Such a deal! If you have priced the rechargeable telephone batteries recently you know the price can vary from $12-$20 depending on the model and the store. So a cordless telephone for a net cost of $10 with all the features I wanted plus the battery was a great deal. The most shocking part of the whole deal (and happily so) was I had the rebate check in my hands three weeks later. That really impressed me! Now, if Best Buy can do it, why do some of the other companies hang on to your rebate money seemingly forever? I think a lot has to do with the companies that are sometimes contracted with and act as clearing houses for rebates. Things are improving however. Some of the stores offering rebates now print a duplicate sales receipt (for the rebate submittal) at the checkout counter. They also print the rebate form with the sales receipt so I don't have to go hunting in some rack on the store wall for the proper form. I still, however, as a matter of course use my scanner to make a copy of my completed rebate form, the UPC (Universal Product Code) I cut from the product packaging, and the rebate sales receipt. I save this on my hard drive as a backup in case there is any problem in obtaining the rebate. In the past many rebate forms have listed toll free phone numbers to call if you have questions or for checking status. Sometimes these numbers were constantly busy or were an automated response that did not allow you to talk to a real person. You might be able to leave a message but then no one ever called you back. My experience is things are getting better. I can now usually find a real person to talk to. And if I cannot, I call the store where I purchased the item. They usually have phone numbers I can call. The bottom line is the stores want happy customers. When I did not receive one of my rebates in the allotted time, I called the listed toll free number and found they had no record of my rebate submittal. Rather then me resubmitting copies from my backup data, they suggested I contact the Circuit City store where I purchased the item and have the store fax a copy of my sales receipt to the Rebate Center. The Rebate Center opened a special folder for my case and gave me the fax phone number and name of the person to contact. I called the Merritt Island Circuit City store and gave my sales order number and the fax information to a most courteous Customer Service representative. She said she would call the Rebate Center and immediately fax the information to them. I got a call several minutes later from the Circuit City Customer Service rep saying the Rebate Center had closed for the day so she did not get a chance to talk to them but would send all the information via fax that night. Needless to say I did get my rebate, but what most impressed me was the great customer service I got from my local Circuit City store and the company Circuit City has processing the rebates. Another thing that companies are now putting on rebate forms is a web site URL where one can go to check rebate status. That is a most welcome thing. In fact, that has been carried even a step further. Recently SCPCUG Member Gary Roden spotted a CompUSA ad for a 64 MB Lexar CompactFlash card for $40 minus a $10 instant rebate and minus a $10 mail-in rebate. With the price of memory on the rise, getting a 64 MB CompactFlash card for a net cost of $20 was a great deal. Gary had been looking for a CompactFlash card and knew I was also on the lookout as I had recently purchased a 1.3 Megapixel Digital Camera. We drove down to CompUSA one Sunday morning and stood in line a few minutes with about ten other guys to pick up this great deal. But I digress. The point I was getting to is that the Lexar rebate form asked for my e-mail address as many of them do. In the past I figured that was just a way for them to get my e-mail address for sending sales information. This time I was pleasantly surprised to get an e-mail message from the Rebate Center soon after my rebate submittal thanking me for participating in their promotion, telling me my rebate has been approved, and that I should see my rebate check in approximately eight weeks. Now that added touch makes this customer feel good! I have never lost money through a rebate offer. Most big name stores will make good on the offer even if the computer software or hardware maker does not. This happened to me once with a rebate through CompUSA. CompUSA actually covered the mail-in rebate with their own check when I could get no satisfaction from the hardware maker. So don't be afraid to go for those rebate offers. 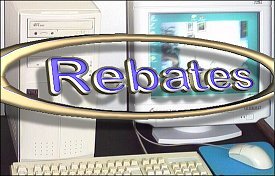 For more information on the handling of rebates check http://Techbargains.com/rebates.cfm. This page has information on the purpose of rebates, how to properly complete and mail the rebate information, and how to track rebate status. It has a listing of rebate status web sites and toll free telephone numbers.